Although the DC Extended Universe isn’t focusing nearly as much on interconnectivity in the aftermath of Justice League, these movies will nonetheless continue to inhabit in the same universe. Take 2020’s Birds of Prey. The movie is bringing back Margot Robbie’s Harley Quinn following her debut in Suicide Squad, and she’ll be returning to Gotham City to cross paths with Black Canary and Huntress, among others. Of course, when one thinks of Gotham City, its shadowy protector, Batman, also comes to mind, but apparently during the events of Birds of Prey, the Caped Crusader is nowhere to be found in the metropolis. No, not that Metropolis! In its report about Jurnee Smollett-Bell and Mary Elizabeth Winstead being cast as Black Canary and Huntress, respectively, Deadline mentions that Harley Quinn will be in a Gotham City “that isn’t protected by Batman.” Now to be clear, up until this point, there wasn’t any indication that Batman was going to appear in Birds of Prey. 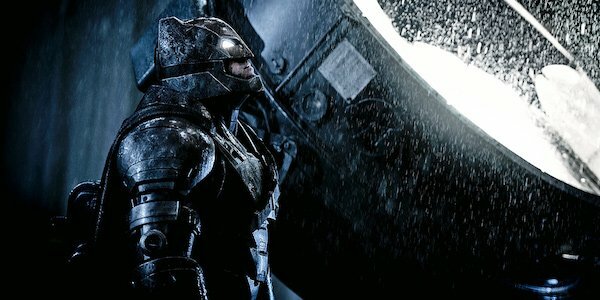 Given that Ben Affleck’s future in the cape and cowl is also in question, we don’t even know if the actor will ever reprise the role, especially since it’s rumored that Matt Reeves’ Batman movie will follow a younger Bruce Wayne. Nevertheless, Deadline’s wording makes it sound like Batman won’t just be absent from Birds of Prey, he’s not in Gotham City at all, which begs the question: Where is he? When we left off with Batman at the end of Justice League, he seemed to be in a much better place than usual. He and his new super friends saved Earth from being turned into another Apokolips by Steppenwolf, and he was planning on turning the abandoned Wayne Manor into the Justice League’s base. Oh, and of course he was continuing to strike terror into the hearts of criminals as a creature of the night. So what happened between then and the start of Birds of Prey that’s led to him vacating Gotham City? Assuming this isn’t just a simple case of unusual wording and that Batman will be lurking somewhere in Gotham during Birds of Prey, my best guess is that the movie takes place while the Dark Knight is on a mission elsewhere, be it solo, with one of the other Bat-Family members or another Justice Leaguer. Either way, with Batman gone, that leaves it up to Birds of Prey‘s eponymous team to fill the void and deal with whatever criminal elements present themselves. No specific plot details for Birds of Prey have been revealed yet, but reportedly the movie’s villain will be Roman Sionis, a.k.a. Black Mask, who is typically presented as one of Gotham City’s most powerful crime bosses. So it’s not difficult to imagine him making a play for Gotham City when Batman has disappeared, leaving it up to Black Canary, Huntress and Harley Quinn to stand in his way. Other characters expected to appear in Birds of Prey include Detective Renee Montoya and an adolescent Cassandra Cain. Stay tuned to CinemaBlend for more updates regarding Birds of Prey as they come in, but for now, look through our DC movies guide to learn what else the DCEU has in development.